The VWR Fixed Speed Vortex Mixer provides single speed, vigerous vortexing with a one touch activation. This lab mixer operates at 3200 rpm and at an orbit of 4.9 mm. There are no controls to set or counters to watch, simply depress the test tube cup to activate. This vortex mixer is built from sturdy materials and has enough weight to prevent traveling when active but light enough you can place it where you need it with ease. 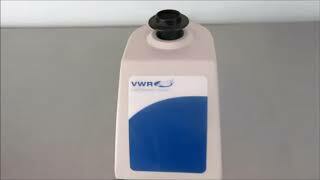 This VWR Scientific Fixed Speed Vortex Mixer is in great working order, there is a slight blemish in the body but is cosmetic and does not effect performance in anyway. All of our lab equipment comes backed with our standard warranty. Should you have any questions, please don't hesitate to contact us.